It's getting to be that time of year - as the mercury rises, so does the likelihood of major transactions. Come July, players will be trading uniforms like we do baseball cards as teams try to lock and re-load their rosters in order to boost their playoff chances. Every summer, we fans wait with bated breath to see where the big names end up and find out if our favorite teams did enough to reinforce their rosters for the grueling schedule to come. Of course, I'm talking about the official opening of the free-agent period in the NHL. What - you thought I was referring to the MLB trade deadline? Oopsy, my bad. Anyway, while Theo Epstein and crew figure out whether they need to acquire a reliable reliever, an offensive boost, or a starting pitcher more for the dog days of summer, Stan Bowman has already reportedly plugged a hole on the Blackhawks' roster. If Chris Johnston of Sportsnet is to be believe, Cam Ward will be bring his mask and pads to Chicago to serve as Corey Crawford's back-up for the 2018-19 season. The free-agent signing period doesn't actually open until July 1st, but it's believed that the one-year, $2.5 million contract is all but official. The Hawks were a major disappointment last season, failing to make the playoffs for the first time in nine years. After nearly a decade of being the dominant force in the Chicago sports market, the current dynastic window appears to be nearly closed. While all phases of the game can be blamed for their rapid decline, their performance between the pipes was a major contributor. Crawford's murky injury issues kept him off the ice for most of the campaign and his replacements simply could not fill his skates. Anton Forsberg, Colin Delia, JF Berube, Jeff Glass, and literal guy off of the street, Scott Foster, posted a combined .902 save percentage and a 17-30-8 record. This simply was not getting the job done and, with Crow's health still a big question mark, a reliable, veteran presence was needed in the net. The longtime goalie of the Carolina Hurricanes is certainly no longer in his prime. Far removed from his days as a playoff MVP and Stanley Cup winner in 2006, the 34-year old has been in something of a platoon, splitting time with former Blackhawk, Scott Darling, last year. On the season, Ward contributed a 23-14-4 record with a 2.73 goals-against average and .906 save percentage in 43 games. Here's hoping that, at the very least, Ward can provide a steady presence on the roster and find a way to lock the revolving door that led to the net in 2017-18. Ideally, a recovered Crawford will keep Ward from seeing too much time on the ice anyway. 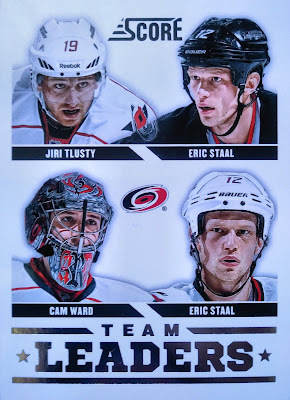 Luckily for me, I had a pair of Cam cards stashed in my hockey trade box, which you can see above. I'll wait until July 1st to add him to my Blackhawks All-Time Roster Collection, just in case the deal falls through before the official signing period begins, but it sure looks as though these previous bits of trade bait came in handy. Perhaps I'll be able to mine that box for more cards once the free agents begin moving in earnest come Sunday? The Hawks sure could use a forward and a defenseman or two and Bowman and company actually have some cap space to work with - Ward's modest deal did not change that. We'll see what happens. In the meantime, welcome to Chicago, Mr. Ward! Oh... and Theo... maybe you can bring in a rotation arm to eat some innings or a bench bat? That roster-shuffling period will be here before we know it. 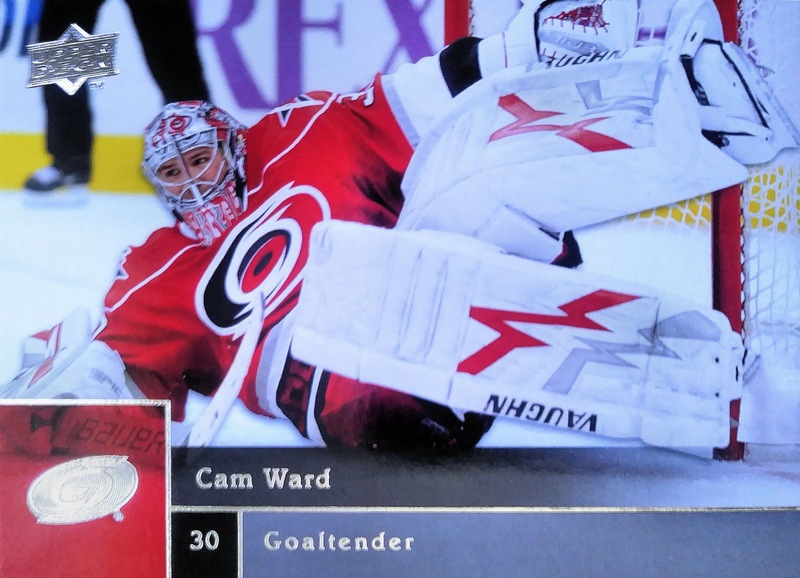 I never liked Cam Ward-mostly because I was cheering hard for the Oilers in '06 and I cant stand the 'Canes franchise. But now that he's in Chicago that will change. Can't believe he's 34...where does the time go?